We also run solo rafting course contact us for availability and pricing. Splash White Water Rafting run several Raft Guide Training courses each year in Scotland and also in Morocco. These are IRF 'International Rafting Federation' approved courses for qualification as a raft guide. 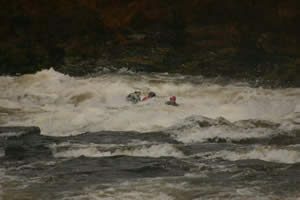 The course includes Swift Water Rescue Certification and if required First Aid Qualification. With this qualification, you can obtain paid work as a guide in Scotland and in over 30 international countries. There is an additional option to join a longer course with the 2nd week in Morocco involving multi-day river guiding skills. If you have no water experience at all call us and ask to come along to Splash Rafting and gain experience prior to doing the course. It will help a lot! You can gain experience by sitting alongside our trained raft guides in Scotland or Morocco. It will also let your experience the life of a raft guide before committing more time and money. Same price for both Scotland and Morocco locations. Minimum of 8 students required for a course to run. A maximum of 12 on any course. Splash ran several courses for both new guides and also experienced guides looking to progress to IRF trip leader and IRF instructor level. Next Course TBA - Contact us now for availability / info. Demand for these raft guide courses is high so please plan ahead.